Mike Bell, 34, was introduced to the game at Reading School. 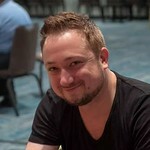 He initially didn’t show much talent for cardplay and may have lost interest in the game had he not found, in schoolmate Joe Mela, a partner willing to put up with his system experimentation. Within six weeks of Mike’s first duplicate, they had tried playing three different 1NT opening ranges and four different meanings for a 2D opening! At the under-20 trials the next year they were introduced to Michael Byrne, at the time one of England’s top under-25s. Mike benefited greatly from the squad system, and four years on, he and Michael formed a partnership. Junior bridge had significant upsides away from the table as well – at the 2009 Europeans in Romania, Mike met Sarah, whom he would later marry. They lived together in Cambridge while Sarah finished her degree before moving to Manchester, where Sarah trained to be a teacher. During this time, Mike made his living playing online poker. This required playing the best part of two million hands each year, and naturally his bridge development suffered. The anti-social hours meant that, while playing the Premier League, he was so “jet-lagged” that he put the opposing declarer's hand down as dummy, which as far as we know is a unique occurrence. Thankfully, that declarer, Espen Erichsen, put the incident behind him, and teamed up with the two Michaels to win the same event the next year. Bell and Byrne’s other triumphs included the Camrose, two Lederers, the Chairman's Cup teams event in Sweden and the pairs at the prestigious Yeh Bros in Shanghai. In 2013, Sarah got her first teaching job, in Hammersmith. Mike took the relocation as an opportunity to “cash out his chips” and become a full-time bridge player. Two years later he joined Alexander Allfrey’s team, partnering David Gold. As well as many victories in domestic events, Mike and David have also found success in the USA, reaching the semi-finals of the Spingold and winning the Mitchell BAM. Aided by the increase in popularity of mixed events, Mike and Sarah are increasingly playing as a professional partnership. Their victories together include the Four Stars Teams and the Tollemache, and they came agonisingly close to a medal in the World Mixed Pairs in Orlando. With both David and Sarah, Mike plays his home-grown system, “TriBal”, based on five-card majors and a strong NT. 1D is opened with 12-14 balanced and 1C with good 17-19 balanced, meaning both minors may be just two cards. However, his approach to bidding systems has become increasingly practical – he feels strongly that it is easier to bid and play well if you are not having to actively think about what’s written on page 34 of your system file. When asked for his favourite hand, the choice was clear - the time he psyched a world-class pair out of their 6-4 club fit in the semi-finals of the Spring Foursomes. His bid worked even better than he could have anticipated – the opponents played 5D in a 5-0 fit, going six off vulnerable!